Kerala Plus One (+1) second allotment 2014 results are now available at HSCAP website. 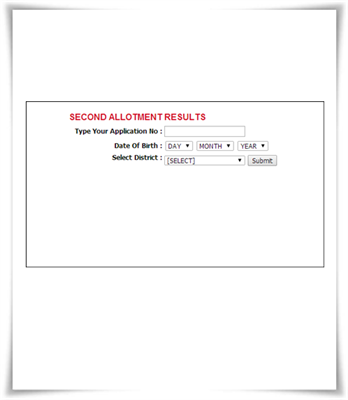 Candidates who have applied for the Kerala Plus One Admission 2014 and couldn't find their names in the first allotment can check their allotment status from www.hscap.kerala.gov.in, the official website of Kerla Higher Secondary Education Department. As the admission process is made through the single window system, the results should be checked in the online portal. The second allotment list of Kerala Plus One Admission 2014 got published on 9th July 2014 at the official website of Department of Higher Secondary Education (DHSE). Students who have applied for the Kerala Plus One Admission 2014 and couldn't find their names in the first allotment can check their allotment status from www.hscap.kerala.gov.in, the official website of Kerla Higher Secondary Education Department. The admission process is made through the single window system while students can know their allotment status by providing their application number and date of birth in the relevant columns. Students have to login by entering his/her application number, password and district. It is very important that, students who got admission in the second allotment must remit the fee and compulsorily secure admission at the respective schools on 9, 10 & 11 July. As the main phase of Kerala Higher Secondary Centralised Allotment Process will come to a close with the Second Allotment, the classes will begin on 14th July 2014. The school/combination transfer and supplementary allotments will be published soon to accommodate more students to fill the vacant seats. The admission process of the current year will come to an end on 27th August 2014. With 4, 87, 366 students submitted applications, the number of vacant seats are 3, 26, 980. In the first allotment 2,16,191 students got admission, while the rest of the seats are being reserved for management/community quota in the government, aided schools and unaided schools. The Kerala Plus one allotment schedule for the year 2014 with important dates concerning the admission procedure is given here. The 27,000 teachers in the higher secondary department will under a training which is being conducted in three schedules. As the allotment will satisfy only 3.67 lakhs, the rest of the students would have to purse higher education with the open school system in 2014. To check the second allotment, students need to use the login by entering his/her application number, password and district in the specified columns. If you are a candidate applied for the Kerala Plus One Admission 2014, check the allotment here. Kerala Higher Secondary First Year (Plus One) textbooks 2014 – 15 are now available in PDF format at SCERT website. The first and second chapters of subjects like English, Computer Science and Physics can be downloaded for the website. The State Council of Educational Research and Training (SCERT), Kerala has published the new text books (38 Titles) for First Year Higher Secondary (Plus One) course.